Whilst I can see the theme refresh has broader appeal and does actually work quite well within Windows XP’s Luna theme… it really feels out of place under Classic with OS palette changed to that of Windows 2000. Pingback: Download The Firefox 1.x Classic Theme - CyberNet News: Hardware, Downloads, Gadgets...Technology Done Right! Do you know why the “Go” button was combined w/ the search field? I don’t like having the “Go” button up there. It’s very strange. Also, a nit. The magnifying glass seems off in Winstripe Classic for Windows. It seems out of place. But thanks for maintaining this theme. Rafael, I think the Go button being attached to the search field is a bug. Here are all the bugs related to the visual refresh landing. I haven’t had a chance to clean up the Classic themes yet. The first step was packaging them up into stand-alone themes. I’ll be updating them soon. I’m using Firefox 2.0 beta2 and this theme looks extremely weird… the go button is enormous! Please fix this! I’ll have a new version of Pinstripe soon. I haven’t worked on Winstripe at all yet. If someone wants to help out, that’d be great. Thanks for this theme! Beta 2 looks really ugly on Windows Classic. I also installed the extension mentioned by Will to fix the Go button. What about Linux? Can we install Winstripe or are you going to release a specific Gnomestripe version? I’ve only tested this on Windows XP. If your OS theme is Classic, remove the margin-top and margin-bottom styles from .search-go-button. Thanks Hasan and Legege! I’ll try to incorporate those CSS changes soon. Nice! Love your search-go-button styling. @ Kevin, thanks for updating this theme for 2.0. You wouldn’t believe the amount of criticism the new theme is getting @ forums.mozillazine.org. Other that that, not bad; although it is pretty noticeable that itâ€™s not real. GO button and search box MUST be fixed before i can consider actually using this theme. Please, don’t forget to create a version for Linux! When will you implement the fixes posted in the above comments. I, and many other people, do not want to have to change their userChrome more than necessary. Also, will you consider putting this on the Addons web site? Just thought I’d give the heads up that the background for the search button is fixed now, presumably due to the aforementioned button being fixed to inherit the native background – it’s no longer grey. One of the check ins for the drop down button has caused a problem though – it is too wide and shifts when the length of the string within location bar changes. Has anyone know the fix for the latter? And also, how to give the search drop down selector a native bevel. Simple, really *slaps self on forehead*. I don’t know how the background hover state works, is it an additional image? …should fix the go button. Thank you for the Fx 2b2 theme fix! Did I say thank you?! The windows version of the theme works ok in Linux (gnome at least), although the “Go” button is a bit too big – but definitely an improvement on the ffox 2 default theme! Thanx thanx thanx. Hated that new FF theme .. It fixes the problem regarding the search box being too wide. I have only tested it on my own system, so I can’t guarantee that it will be bug free. First, thanks for this. I could fill up the whole message box with “HATE”, and it still wouldn’t cover how I feel about the v2 skin. Please note the TWELVE magnifying glasses next to the oversized search box. They appear whether the I’ve edited the userChrome to remove the Go and Search-Go buttons or not, and nothing like it happens with the default look… which may be the only nice thing I can say about it. This capture also shows all errors displayed in ConsoleÂ² while at the site. If there’s more I can do to help, let me know. It doesn’t apply CSS fixes to the theme mentioned here, but has been developed independetly. All areas have been updated carefully so it should feel quite polished. Some icon updates (effects for small icons in address bar) are also included. 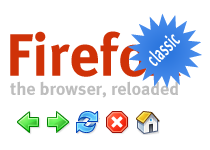 The theme will at least be maintained for all Firefox 2.0. * versions. is broken. Can you get that file back up on your site, or maybe post the CSS code here as another comment? I’m having the same problem as Bigbootay, and the theme Florian Schmitz links to (Winestripe 0.9.1) doesn’t look as nice as Winstripe. I’d like to know what code I can put into my UserChrome.css file to fix that one remaining issue in Sethramoth’s theme. Sethramoth, your theme is very nice, and I like how you applied the fixes. I am using your theme. Maybe you can fix this thing with the 12 magnifying glasses? It only comes up rarely, on websites that embed OpenSearch plugins. Sorry, the link is working now. Looks like official 2.0 released messed up the search box and the new close tab icons on the Mac. Any chance we could get a quick update on the Pinstripe FF Classic for OS X? I know you’ll probably say just use the new Pinstripe, but I like the classic FF look. Regardless, thanks for your work! But it might be tough for you to find your chrome directory in your profile directory (which is in %appdata%\mozilla\firefox\profiles on Windows XP, in case you are interested). And even if you do edit your userChrome.css file (which does not even exist by default), anything you do will impact other themes and possibly ruin them, if you like to switch between themes. Of course, there is a much simpler solution. Thank you so much for publishing this! I was about to downgrade back primarily because of the theme. A big thank you! Something wasn’t sitting right with me on the new default FF2 theme, so glad I found your site! When will the developers recognize that you can’t give software a new look just for kicks? There are people out here that chose Firefox because of a simpler look. Now, to maintain security, we are forced to upgrade to this. The arrogance. Goodbye, Firefox.